When you look at women at Moscow or St. Petersburg streets, you’ll notice that many Russian women have incredibly beautiful hair. They like to wear it long and flowy. Have you ever wondered how Russian women care for their hair? It’s every woman’s dream to have shiny, healthy, and flowy hair. Maybe we can borrow some tips from Russian Ladies on how to have great hair. Russian ladies take extra care on this part of the body. They are known to wash hair regularly every day (which is actually unhealthy for hair). Not only washing, but Russian women also use a hair mask, commonly from natural ingredients. There are not many beauty salons in Russia in the past, hence many opted for homemade treatment. Nowadays, however, it is easier to shop haircare in Russia. There are a lot of brands just emerged recently, specializing in natural and organic products. They have various range of hair care products aside from face care and body care. Notable names include Natura Siberica, Organic Shop, and White Agafia. They are pretty famous in the European market too apart from being popular in the local market. Natura Siberica use the traditional wintertime honey-based drink as the main ingredient of this shampoo. Honey sbiten is one of the traditional beverage in Russia. The honey in it cleanses hair gently while giving an intensive moisturizing. It is a shampoo recommended for damaged hair. If your hair is colored and dry, this product can be helpful to give back the shine of your hair. The birch tree is a natural ingredient often used in traditional beauty treatment. Birch juice is an excellent cleanser and has anti inflammatory properties. This shampoo attempts to benefit from these cleaning properties. This shampoo also offers Strengthening benefit since it contains nettle, another popular herb for hair loss. White Agafia Organic Nettle Shampoo is free from parabens and mineral oil. It is also 100% vegan. As the name indicates, this shampoo contains nettles. It stimulates hair growth and strengthens roots. The shampoo also contains Burdock oil and St. John’s wort, which also has the benefit of stimulating hair growth. The borage oil nourish the hair, resulting in suppleness and softness. The last ingredient added is Yarrow. Yarrow is beneficial to restore the structure of the hair. Yarrow also prevents hair damage. After shampoo, there’s also hairmask. For hairmask, try the Wild Siberian Juniper Hair Mask from Natura Siberica. Juniper has regeneration benefit and it promotes hair growth. This shampoo is targeted for women with colored hair. Other ingredients added here include pure wormwood oil for dandruff prevention and nettle for hair strength. Make your hair shinier and softer with this awesome smelling hair mask. Express Repair Hair Mask Honey Avocado from Organic Shop contains organic avocado oil and organic honey. The mast helps strengthen your hair and improve the structure. To use this mask, apply it to damp hair and message gently. Rinse thoroughly after 2-3 minutes. This everyday conditioner contains rosemary oil and chamomile. It has a calming effect and antiseptic properties. Chamomiles has anti-inflammatory benefit. It also has anti-bacterial properties, which helps to fight dandruff. Use this conditioner after shampooing the hair. Message the scalp gently and rinse the hair after 2-3 minutes. 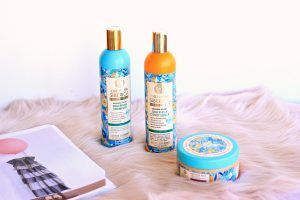 Blue Lagoon Mineral Shampoo by Organic Shop is one of the brand’s best selling product. The shampoo uses wild organic algae extract as its main ingredient. It is beneficial to repair hair structures. Natural clay is also used to provide the necessary nutrients in order to make hair stronger and healthier. Northern Cloudberry Shampoo treats severely damaged hair and colored hair. The shampoo uses cloudberry extract as its main imgredients. Cloudberry extract has a high content of omega 3, omega -6, vitamin A and C. The high nutrients ingredient is to ensure the repair of hair structure from the inside. Although the conditioner name contains the word “color” on it, Color Conditioner Golden Orchid is actually for all kinds of hair, dyed or not. The conditioner helps enhance your natural hair color. It also promotes hair elasticity, so the strands don’t easily break. The orchid extract is beneficial to make the hair shiny and looks silky. The conditioner also contains Jojoba oil. This hair mask is the best selling product of this brand. It has all in one benefits with only one package. This hair mask contains Grapeseed oil and olive oil. The oil ingredients here help moisturizing dry and damaged hair. The vitamin contained in the oil provides all the nutrients needed for a strong, silky and soft hair. The hair mask also contains 16 amino acids. You can find those products above on cosmetic stores across Russia. Brands such as Natura Siberica and Organic shop has their own dedicated stores in Moscow and St. Petersburg. If you reside in Europe, you can buy it through online stores. However, the most convenient way to buy it is directly in the shop when you’re visiting Russia. Tourists like to buy Russian cosmetics products as a souvenir. There are more ways to preserve and maintain your healthy hair apart from using shampoo and mask. A simple habit such as protecting hair from the sun goes a long way. It is also advisable to dry with a towel by rubbing it softly. Also, minimize the usage of curling or straightening hair as it is can be damagin to hair structures.